Ask fellow campers about "Kampfires Campground, Inn and Entertainment" and nearby attractions. We were pleasantly surprised by what this campground had to offer. The sites were clean and spacious, mostly level. Pool was large and newer with plenty of patio furniture and cabanas, and deep enough for diving and jumping. Mini golf was available, a little dated but still challenging. On site ice cream snack bar, and onsite food truck with corn hole and other games in a shady spot. Lots of other things to do, such as shuffleboard, horseshoes, badminton. There has been a lot of recent improvements, new gravel, grass, signage etc. They also have a large ampitheater, which was an old gravel pit, used for concerts and such. We happened to be there during Cajun Fest, and had such a good time listening to 3 bands, trying crayfish, dancing, and eating from food trucks and having craft beer. It was a well produced event, many locals in attendance. 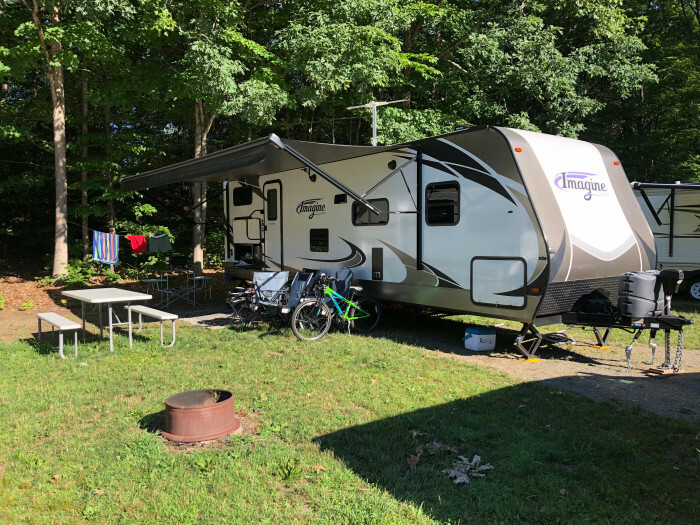 Had a little road noise, and a nearby trucking company was working early Saturday morning which woke us, but otherwise a really nice campground. 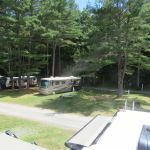 We camped at Kampfires Campground, Inn and Entertainment in a Travel Trailer. Downtown Brattleboro is a 10 minute drive, and a nice place for walking and shopping. Grafton Village Cheese factory is a must see, for many free samples of cheeses and spreads. Nearby are some covered bridges and good kayaking. This park provided amazing value for the money (especially with the PA discount). The sites were spacious. They had a large pool and playground. We took advantage of their extensive book and DVD exchange. Their ice cream and beer are a bit expensive, but the quality and selection are great. The park has many mature trees, but we didn't have any mosquitoes at our site. The utilities worked well. The showers and bathroom stalls were clean and above average in size. The only minor issue we had was some puddling around our truck and trailer during a heavy downpour, but it had mostly drained away by the next morning. We would definitely return to this park. We camped at Kampfires Campground, Inn and Entertainment in a Travel Trailer. There is an Aldi grocery store nearby that offers good selection and great prices. Easy in/out and registration at the park. Large pull-through sites, some shaded, some not. We camped here for a month and enjoyed exploring the local area and nearby NH sites of interest. 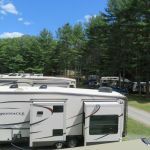 The campground is well kept, staff friendly and helpful. This is an old campground recently purchased by a young couple. They are working hard to upgrade the facilities and began by adding sewer connections and upgrading electric to accommodate big rigs. They plan to continue the electric upgrade. The pool area is newly upgraded and is very nice. Even with pool memberships available to the locals, the pool was never overcrowded. Owners are releveling some sites as well. Bathhouse recently renovated. Recommend the park. We camped at Kampfires Campground, Inn and Entertainment in a Motorhome. Things to do in Brattleboro - shops, restaurants, 2 grocery stores. We were here over 4th of July and enjoyed the town's celebration and fireworks display. Small towns are within easy driving distance. Beautiful scenery in the mountains and along the rivers. Local swimming holes. A ride out to Hogback Mountain is worth the trip. Madame Sherri Forest in nearby NH is worth a trip; hiking/walking trails, pretty scenery. As we were sent over the hill to the F loop I didn't know what to expect. We were greeted with about a dozen sites surrounding an open grassy field. The sites backed up to trees. Beautiful morning sun and afternoon shade. All types of campers from Class A rigs to tents can be accommodated in the various settings. We didn't use the pool or mini golf but it looked like fun. They have a food truck on the weekends and sell ice cream 7 days a week. Good wi fi. No cable but we got some reception with an antenna. Only had 30 amp sites when we reserved but that was sufficient. 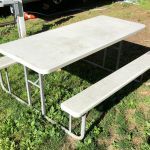 Each site had a sturdy picnic table which could easily be moved on your site. Good location for seeing many sights. The office personnel is very knowledgeable and helpful in local info. The rate is the average withPassport America being used. Would definitely come back. 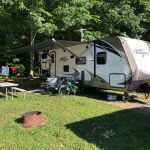 We camped at Kampfires Campground, Inn and Entertainment in a Fifth Wheel. ANTIDOTE NEW and used book store Is down the road in Putney. Also visited HIDDEN SPRINGS MAPLE for syrup tasting and maple cream ice cream. Had lunch at WHETSTONES BREWERY in BRATTLEBORO. Bought groceries at HANNAFORD's. Crossed the bridge into NH to a liquor outlet about 2 miles away. 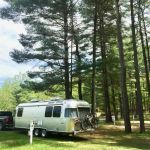 Overall a small campground but location is close to Brattelboro and not far off I91. Pool was very nice and I like that it had an access code for the gate. Good WiFi, but limited to two users - we are a family of 4 so that was an issue. No cable, at $50 per night they need to add that. Great reservation system and web site. We had a 30' travel trailer. Has mini-golf which we plan to use. Also has it's own ice cream shop which we plan to visit. We stayed at the KOA just up the road last year which was nice, but I like this campground better. The pull through sites (A & B) are very large and had large 5th wheels and motor homes. 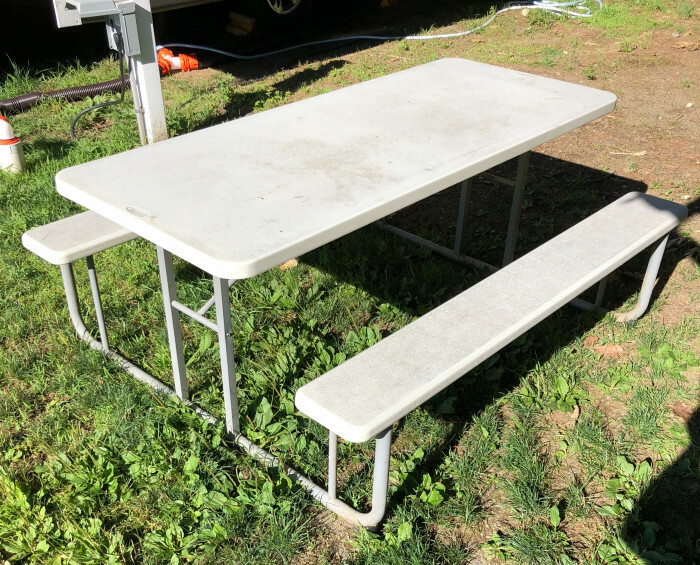 Picnic table was a modern plastic table which I had never seen. We camped at Kampfires Campground, Inn and Entertainment in a Travel Trailer. Originally they gave us F8 which is too narrow for a modern camper. We called office and they were fine with us switching to F5 which easily fit us, great customer service. September 27, Kampfires Campground, Dummerston, VT Passport America $19, 39 sites, full hookups, amphitheater, basketball, volleyball, playground, dump station, dog area, horseshoes, pool, mini golf, Scoops ice cream shop, laundry, bathhouse, pets are charged extra, Wifi included, cable available We stopped here for our last night before we head home because it honored Passport America. Very reasonable and it had full hookups which we needed. I believe this was a private campground and recently changed owners. Easy off from I91 to the campground. Very peaceful on a very hot day in October. We were pleased with our checkin and the girl that was working there. Nice stay and we would stop here again if in the area. We had a back in site but pull-throughs were available. Good stop! We camped at Kampfires Campground, Inn and Entertainment in a Motorhome. This is a small park in a very convenient location off of I-91 and close to Brattleboro. We would recommend it for passers by. There is a nice farm-stand just north of the campground with fresh produce. Also close by all necessary shopping. There seem to be new owners who would like the business to be profitable and this is a little too obvious. They ask for $5 for unlimited wi-fi, in theory unlimited streaming. However they don't allow more than two devices on the free wi-fi, so to connect more than two one needs to pay the $5/day. Not good internet anyway. Also they ask for $5 for late departure, even for one hour. These are not large amounts but they indicate a certain attitude that is not very generous, so we didn't feel like staying a minute longer than necessary. In fact had it not been for PA discount (4 nights max) this wouldn't have been good value. The price above reflects an average of 3 nights PA and one night full price. Even though it is a small place we couldn't locate the facilities easily. The laundry room has a code, given upon arrival, but it wasn't indicated on the map so we didn't bother. There are sites under nice trees and sites in full sun. We didn't think to ask and we got the full sun, unfortunately. All sites seemed to be pull-throughs. We camped at Kampfires Campground, Inn and Entertainment in a Motorhome. Thanks for your visit. Our WiFi is brand new, with a 100Mb fiber backbone. 2Mb service is included at no cost with every campsite booking. The upgraded WiFi option is to bump up to 10Mb service, which even supports streaming Netflix in HD! We camp onsite ourselves and use the premium WiFi daily! The premium offering does have a small charge of $4.99/day or $15.99/week through our provider, but seriously beats the pants off any WiFi we've ever come across at a campground! 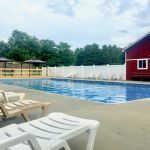 Sorry for any confusion about our offerings, it's brand new (like most of the amenities at our newly renovated campground!). Based on your feedback we've just started handing out a flyer at checkin that explains it better. We wish you many happy travels! First time campers in the area. Friendly staff, large site but gravel and grass. Our site was nice and shady, beautiful pool. Site B10, 30 amp, no sewer. But honey wagon comes around every other day free if you need it. Very nice off leash dog area. Close to several covered bridges. We camped at Kampfires Campground, Inn and Entertainment in a Motorhome. Rate reflects PA rate. Park and site were easy to access as were the utilities. The site was reasonably level. Verizon barely worked there. It has been some time since I have been there but I recall my stay as pleasant and considered staying again on my return route. I just feel that the prices charged are excessive for only water and electric--and I stayed an extra day over the weekend and the weekend rate was increased significantly. But I have found this to be typical of parks in the eastern US so I am not singling out this park in particular. Only explaining why I only gave "satisfactory" on "value". The swimming pool was delightful. It looks new and is well maintained. The laundry room did not have near enough washers and dryers for the size of the park. They have an ice cream shop on the premises so beware. We camped at Kampfires Campground, Inn and Entertainment in a Motorhome. Brattleboro is not far. They have a wonderful Co-op. This was the third time we stayed at this park. New owners this year just starting to upgrade older park. New pool and surrounding area. Understand plans include full hookup vice current water/electric sites. Also new 50 amp FHP sites are planned. Campground is centrally located for easy sightseeing/exploring. Lots of crafters in the area. We camped at Kampfires Campground, Inn and Entertainment in a Motorhome. Several craft brewery/dining places. Whetstone Station Restaurant and Brewery should top your list. Don't miss Katy's Restaurant. 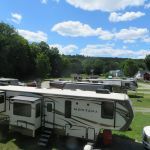 Hidden Acres is a very nice, quiet campground that is framed by Vermont beauty. The roads are a little narrow, but absolutely no problem to navigate. Some sites are in wooded areas; others in the open. Most sites don't have sewer hookups but 3x weekly honey-truck service mitigates this shortfall. 30 amp power appeared stable, OTA television reception was limited to NBC, PBS and several Christian stations and Verizon 4g-3bars was good. Sites were grassy, fairly level but did require some front-to-back adjustment. Check-in staff was friendly, helpful and knowledgeable of the area. Cost is PA and is available for 4 weekdays. We liked this campground and would stay here again. We camped at Kampfires Campground, Inn and Entertainment in a Motorhome. We came on Highway 9 from I91 Exit 4 with no problem, but Exit 3 has 13 feet 9 inch clearance and it is also no problem for us but aa tall fifth wheel didn't lost air conditioner. Exit from Highway 9 to campground is hidden and on curve. Once at campground, plenty of room to register and negotiate campground. RV sites are level grass/gravel, weak 30amp, good water pressure, with dumpstation at entrance to camping area which makes for inconvenience. Evidently a honey wagon will dump you at site and know that if you use dumpstation, it has its own very leaky dump hose to use as it is connected to drain in dumpstation. Many tent sites and campground is quiet, dark but some of the longer term sites are quite messy as there aren't very many rules. Don't believe pool or miniature golf are usable. Very friendly and helpful host. We camped at Kampfires Campground, Inn and Entertainment in a Motorhome. Vernont's longest covered bridge, Brattleboro, Basketville all close with gas station at exit four very accessible. This is an attractive park. We couldn't get TV on our satellite because of the trees around us, but it appeared other people could. We also had no sewer hook-up at our site, but they do have a dump station & some sites to have hook-up for it. They have a lot of amenities here. If ever in this area again we would consider staying here. We camped at Kampfires Campground, Inn and Entertainment in a Motorhome. Very nice comfortable park. We were there just before they closed for the season so we nearly had the place to ourselves. Very quiet with good long pull-through sites, good Wi-Fi, and good water pressure. The only knock is the very weak electrical. Even with a nearly empty park the voltage was low. We camped at Kampfires Campground, Inn and Entertainment in a Motorhome. This is a nice park with big, pull-through sites available in shady area. There is no 50-amp, but it was fine, as it was relatively cool outside. There was also no sewer, but unlike other reviews here, we have not seen a honey wagon in two days. We were here over a weekend, so maybe they don't do the service on weekends, though the owner told us he would be around at least every other day. There is a large agility course/dog run on the hill above the campground, and there was an agility competition over the weekend. Even with this, it was a pretty quiet campground. Main issue for us was the intermittent wi-fi. The connection could often not be made at all with the internet, and we used our own hotspot for the majority of our time here. 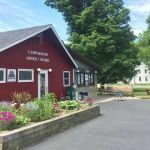 I would stay here again for the location, and there are many covered bridges in this area to see, as well as farmers markets and scenic drives. We camped at Kampfires Campground, Inn and Entertainment in a Motorhome. Are you affiliated with Kampfires Campground, Inn and Entertainment ?